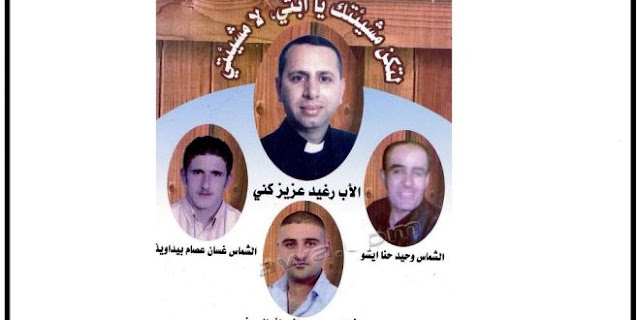 Mosul (Agenzia Fides) - The Congregation for the Causes of Saints gave the nihil obstat - permitting to begin the process of canonization of Chaldean Iraqi priest Ragheed Ganni and the three deacons - Basman Yousef Daud, Wahid Hanna Isho and Gassan Isam Bidawid - killed June 3 2007 by a commando of armed men in Mosul, near the Chaldean church dedicated to the Holy Spirit. A letter signed last March 1 by Cardinal Angelo Amato (Prefect of the Congregation for the Causes of Saints) and by Archbishop Marcello Bartolucci (Secretary of the same Vatican Dicastery), confirms that there is no objection in starting the process of canonization to proclaim father Ganni and the three deacons saints, according to established procedures. The letter, relaunched by the official media of the Chaldean Patriarchate, refers to the request made in November 2017 by Francis Yohana Kalabat, Bishop of the Chaldean Eparchy of St. Thomas the Apostle in Detroit. Local sources confirm to Agenzia Fides that the Eparchy of St. Thomas the Apostle of Detroit in the United States of America would be handling the process because of the difficult conditions facing the church in Mosul. The Cause of canonization will have to declare that father Ganni and the three deacons were killed in odium fidei, Latin for "in hatred of the faith". The martyrdom of Father Ganni and of the three deacons occurred on Pentecost Sunday, near the Chaldean church dedicated to the Holy Spirit, after the celebration of Holy Mass.